YouTube has billions of unique users and is the second popular search engine after Google. The video is a great way for brands and individuals to Engagement on your YouTube Channel audience. 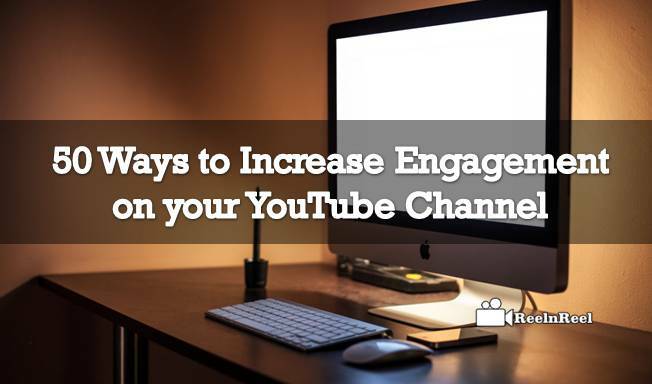 Here are few ways to Increase Engagement on your YouTube Channel. 1. Metadata helps the video to be found by the search engines. 2. Give the detailed description of the video, use an engaging headline and proper tags. 3. It is proved that having a good thumbnail will increase YouTube engagement. Use thumbnails that grab the attention of viewers. 4. Thumbnails should be simple, beautiful or intriguing. 5. Use annotation properly. Use correct calls to action asking the audience to subscribe to the channel. Visit the blog or website, register with the site etc. 6. For the success of a YouTube channel, maintaining consistency is very important. 7. Establish a pattern in video lengths, titles and production values. 8. Though shorter videos proved to engage people better, use the best length for instructional and educational videos to provide full information to the audience. 9. Respond to the comments of the audience. 10. Talking to the viewers helps in building relationships and in turn helps to get more likes, views and shares. 11. Upload videos regularly. Follow a schedule. 12. Post all the videos on your channel on social media sites. 13. Post the link on the Facebook and include the call to action to check the other videos on the YouTube. 14. Write the video title using not more than fifty characters. 15. Engage the social media audience also by embedding the YouTube channel videos on blogs and websites also. 16. The ideal length of the YouTube videos in the channel should be not more than three minutes. 17. Use Google search to find the keywords for the channel to help it rank better in search results. 18. Create playlists for the videos in your channel. 19. Create an intro for all the videos. 20. The video titles and descriptions should contain relevant keywords. 21. To get more subscribers for the video, create a captivating channel trailer. 22. Include call to actions in annotations. Call to actions should be strong and clear. 23. Videos on trending topics help get short term views. 24. Also, create evergreen video content to help over a long haul. 25. Embed video URL on blogs and sites and include a subscribe button. 26. Encourage audience to like the videos and share them so that YouTube knows that your channel is popular. 27. Respond to even negative comments. 28. Cross promotion of video content with other YouTubers also helps to get more engagement. 29. Reach to most engaged fans and encourage them to share the videos on your channel. 30. Behind the scenes videos are most engaging contact. 31. Also, promote the videos to email subscribers. 32. Use keyword suggestion tools to find long tail keywords to be used in titles of the video. 33. Optimize the channel for search. 34. Video transcriptions help the search engines to understand the content of the video more. 35. One of the videos in the YouTube channel can be included in a popup box on the website. 36. The description of the videos should be between three hundred and five hundred words. 37. Use keyword tags first and other tags liberally. 38. Try including the word ‘Video’ in the title. 39. Promote your channel also not alone your videos in social network sites. 40. Keep the YouTube channel fresh by removing the outdated and unsuccessful channels. 41. Transcribe the video content in different languages. 42. Add subtitles and closed captioning on videos in your YouTube channel. 43. Ensure that the video content in the channel is unique and valuable. 44. Learn to use annotations properly to encourage viewers to watch other related videos in your channel. 45. Create content on trending topics. 46. To improve video rankings in search results build links to YouTube videos in the channel. 48. Comment on the videos of others. 49. Form relationships with YouTube community. 50. Apart from the above freeways, there are paid ways also that help increases engagement. YouTubers who want to increase engagement on their YouTube channel, other ways such as Facebook ads can be used and these are paid ways. Paying Twitter ads also helps promote the YouTube channel. Everybody use YouTube to watch video and get some stuff. here we have listed 50 points to Engagement on your YouTube Channel .Guide to increase your YouTube channel, tips and tricks for user engagement.